Many readers said they enjoyed reading details and looking at pictures in my feature several weeks ago, depicting some of the Sheffield pubs which opened during the post-war years. Because a number of new pubs were not included I thought we'd have a look at some more. Quite a number displayed new architectural styles, incorporated up-to-date facilities and were opened by brewers whose companies have long since disappeared or have been absorbed in large conglomerates. So, raise your glasses once more to Sheffield's post war pubs. William Stones' Brewery announced in April 1965 that they were demolish the Plumpers Hotel, Bawtry Road, Tinsley (dating from at least 1825) and rebuild it less than 20 yards away. It was in the way of a fly-over for the Sheffield and Leeds motorway. It was intended to build the new one before demolition of the old. The new Plumpers had been in existence for approximately 35 years when licensee Wendy Fowler broke the news to her regulars that the pub was going to close. She said the brewery had given her only a short time to quit the pub so work could start to convert the premises into an American golf shop. Consequently, angry regulars launched a petition and planned to obstruct any development by handcuffing themselves to the pub. A spokesman for Punch Taverns, who owned the premises, said "Plumpers has been run on a short-term basis with temporary managers for the last five years. It's now time to develop the site." On Tuesday night, April 11, 2000, Plumpers closed without incident. Lt Col F Eric Tetley, chairman of Joshua Tetley & Son Ltd, turned his hand from brewing beer to pulling pints on March 17, 1966. He was marking the official opening of his company's newest pub, the Samuel Plimsoll at Hyde Park, by pulling the first pint through the pumps. Standing by to watch that beer pipelines were in full working order was William Hatton, a former plumber with a city firm. The new pub, named after Samuel Plimsoll, inventor of the famous Plimsoll line, was the third at the huge Corporation flats development. The title Samuel Plimsoll was taken for the new house, said a brewery official, because Plimsoll once worked at Thomas Rawson & Co. Ltd's Pond Street Brewery before moving into shipping. In fact, Plimsoll invented a very successful method of fining beer while working in Sheffield. "His brewery was taken over by Duncan Gilmour & Co in 1946 and the latter was subsequently absorbed into the Tetley group in 1954," said the spokesman. Managing the new house with 32-year-old William Hatton, former manager of the Lion Hotel, Nursery Street, Sheffield, was his wife Lily. The results of two years' work, starting at the drawing board stage and culminating in the completion of a new £35,000 public house, was seen in March 1963 when the Sheaf opened its doors for the first time. Sheffield's newest pub, in one of the city's expanding suburbs, would serve the growing Fraser estate and surrounding districts. The Sheaf was a new licence for owners Joshua Tetley & Son. Landlord and landlady at the outset were Mr and Mrs Albert Petts who were formerly at the King's Head, Darnall. Twenty six years later, Reg Walker was one of only three surviving regulars who were present on that opening night. When the Sheaf reopened after refurbishment in July 1989 Reg, then 77, had his first pint pulled for him by Sheffield United manager Dave Bassett - the obvious guest to mark the re-opening. The opening of the new Shiny Sheff pub on April 22, 1969 had all the appearance of a naval launching. The pub's sign-pole was decked out in bunting and the sign itself cloaked in a Union Jack. A party of Sheffield sea cadets formed a guard of honour as Vice Admiral Sir John Inglis unveiled the pub sign, the Shiny Sheff. The first sod on the site had been cut by H Murray Clarke, RN, the Naval Regional Officer for the North Eastern and North Midland Region on July 10, 1968. The new pub, reported as being the 51st to be built by Tennant Bros since World War Two exploited the naval theme and included several mementoes from HMS Sheffield, the famous wartime cruiser scrapped in 1967, including its original nameplate and some of its stainless steel deck fittings. 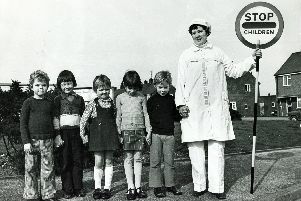 The Shiny Sheff's first licensees were Hetty and Fred Howe, who had come to the Shiny Sheff from the Crow's Nest at Hyde Park. Fred served on HMS Sheffield in 1941 and 1942. As a mark of respect to the 20 men who died when the second HMS Sheffield was sunk in action during the Falklands War, the sign outside the Shiny Sheff was changed in October 1983. "We used to have the World War Two Shiny Sheff up there, but now it's the most recent destroyer and a map of the Falklands," said Fred. The Signpost, a new William Stones pub, opened on September 7, 1966. The premises occupied a hilly site and it was said that architects Melling & Ridgeway had used this to full advantage. The building was on three levels, with the whole of the middle level given over to the licensed premises. The official opening of The Signpost was a happy occasion for the landlord Harry Benson, as the move had meant a return to his old neighbourhood. It was new - but in a way it was old, too. That was the impression people got of the new Sportsman Inn, which opened on March 21, 1958. The aim had obviously been to meet the tastes of customers who liked an old world atmosphere and those who preferred the modern appeal of a contemporary setting. "In this the planners and the owners, S H Ward, had succeeded to a degree which combines delightfully the best of both," said the Sheffield Telegraph. The road with no pub made up for its deficiency on November 12, 1959 with the opening of the Staniforth Arms. For years, residents of Staniforth Road had to seek their evening's entertainment in other districts - all because of a will. The story allegedly went back to the 19th century when the land was owned by the Staniforth family. John Staniforth decided there would be no inns or taverns there, so Staniforth Road had remained publess until 1959. A later generation of Staniforths relented and gave Tennants Brewery permission to name the pub after the family. The first to occupy the pub were 32-year-old Eric Napier and his wife, formerly of the Broadfield Hotel, Abbeydale Road. The Staniforth Arms was designed by Husband & Co of Glossop Road, Sheffield.